Summer of 2010. On my mom and dad’s farm with family for our summer vacation. My sister brings an entry form for a song contest sponsored by the Medora musical in western North Dakota. It’s for a song about North Dakota. 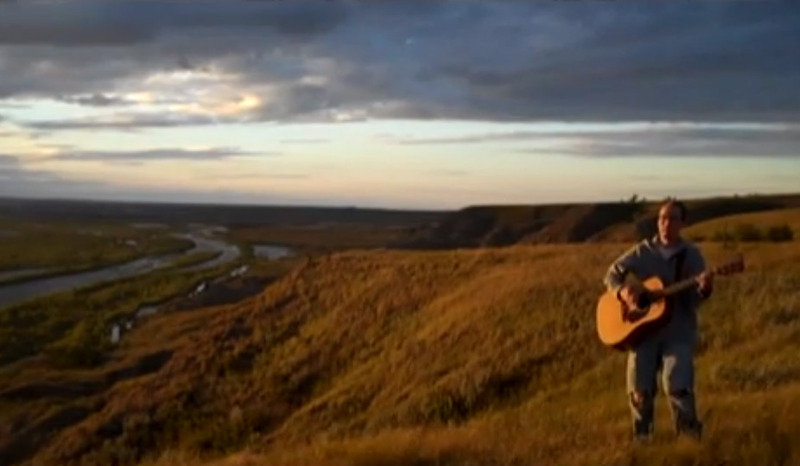 She asks, didn’t you write a song about North Dakota? Yes. I did. Many years ago. I dusted it off and brought it to the studio. Then I read that videos were welcome, and that they’d link the videos to their site, presumably to gauge viewer feedback as a measure of a songs merit. So on a weekend trip out to see my brother on the western edge of the state, I used my Flip video camera to record the trip, setting it up on a tripod and recording myself singing the song in various locales. My brother helped me to the top of a bluff along the Missouri River. He held the camera to keep it from blowing over. So this is that. My effort to pull back the curtain on the all too often unseen beauty of this enchanting terrain.